I’ve got my open water diving license! As tweeted and I’ve shared some of my experiences after every dive. I’m gonna share my entire experience with you. It’s been a great experience getting myself a diving license as I’ve been wanting to get it ever since my friends got it and inspired by movies such as Tomb Raider: The Cradle of Life since I’m a kid! 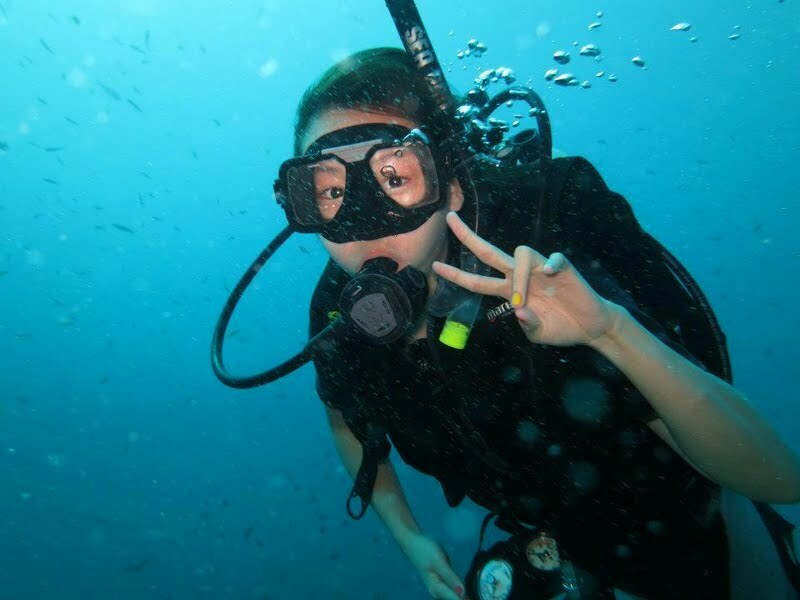 I can now call myself a diver now, I hope in this blog post as I summarize my entire experience on the diving course, I hope you will find it useful and informative, I hope it would be an encouragement to you on getting a diving license yourself! I did my Padi Open Water and confined water diving course in Pulau Perhentian Kecil with Ocean Diving System and our dive center was Quiver Dive Team. While I was working in Groupon Malaysia, I got to know of this diving deal when a concern customer asked about some questions so I did some information gathering and found out it’s a pretty good deal! So I got the boyfie to join me for the adventure and am so glad his willing to jump in for the fun and underwater challenge. Good to have a diving buddy after all so we could dive wherever we wanted to. 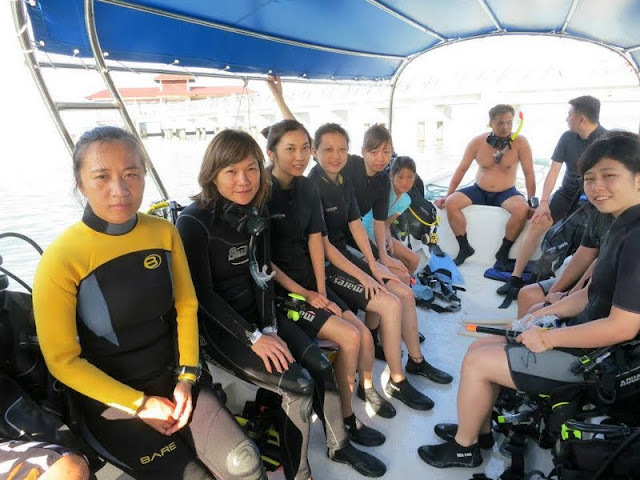 As the deal includes Open Water Diving course and license, it includes 4D3N stay at Shari-la Resort. The first day of the diving course normally involves video presentation and Q&A tutorial sessions for you to understand some basic rules, how to breath underwater and functions of each diving equipment. It is very important not to miss it and pay full attention – well, you won’t want to suffer from decompression sickness or worst face any life threatening situation underwater don’t you? 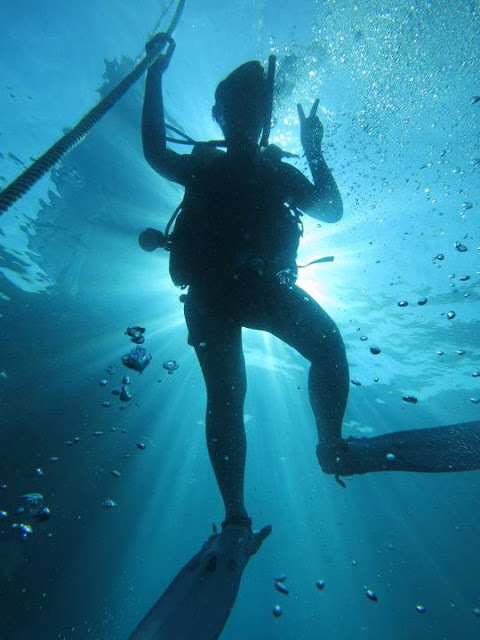 In order for you to get the Padi Open Water diving license as a certified diver, you will need to pass paper exam (70% passing rate) and open water exam. You will need to know how to calculate decompression according to the chart given on different depth dive and duration time intervals. We didn’t have a swimming pool in Perhentian, hence I did my confined water in the ocean under shallow waters. In a way it’s an advantage, as your more familiar to the sea water before heading out for open water diving. Above the picture are all of our equipments, eventually this was set-up all by ourselves every single pieces. We did it like a pro on the second day and even quicker upon getting our license as gearing up is just so easy for us! So do you need to know how to swim before you can dive?To be honest I do not know how to swim, well I get nervous when my body half of it is in the water while half of it is above the water. In short, you don’t need to know how to swim if your enrolling for a diving course (beginner level) however, you should get yourself familiar with snorkeling first, so your more confident and just don’t panic when your out there in the waters. Just remain calm and if you’ve did some reading of your textbook you’ll be able to prepare mentally as you would know what are some of the tests involve underwater as well the sign language and what to do during emergency plus knowing your equipment well gives you confidence. What to pack for your diving trip? Sunblock, swimwear (ladies, bikinis are good enough, one set is fine but you can bring two bikinis just in case), bring lotion to hydrate your skin after a while day out in the water, hair conditional or hair mask your hair becomes super dry and tangled up with seawater, do bring antiseptic wound healing cream plus plaster etc (you might get cuts when your careless underwater during your first few dive due to balancing buoyancy) and clothes with your other essential needs.For scuba diving equipment, you don’t have to buy any before you enrolled in the course, as I would advise you to get your license first before purchasing any dive equipment as you should go underwater with the equipment so you are familiar with it and know what your looking for in an equipment. Dive equipment as recommended divers should have are mask with snorkel glasses (there are specific types), fins, scuba suit (different materials and types for various temperature), dive watch aka dive computer (very important, although pricy but if you dive frequently you may need one to keep track of the depth, time intervals etc that could save your life) and dive bag to store all your equipment. Normally, you can rent the items in dive centers when you engage a dive master and guide; do not ever dive alone as it’s never advisable. So after a day of ‘workout’ under water, we did at first 5 meters, then 8 meters, then 12 – 16 meters the next day and the maximum I went was 18 meters depth. So food, is essential after a long day! We’ve been having fried rice every single day in Perhentian, besides food takes about 1 hour to serve a table, fried as recommended by our Dive instructor Leslie is the best. Group photo before our first dive after getting certified as open water diver! 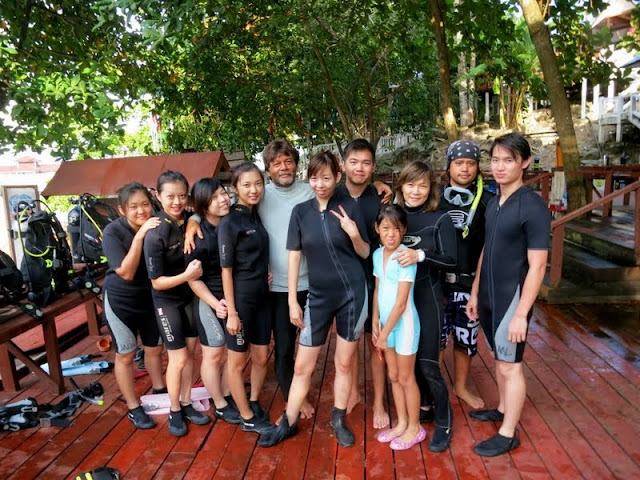 With our instructor Leslie in the middle.Look at my supper lose scuba suit, that is why one needs to get their own suit for a proper fit so you don’t get air bubbles stuck inside your body when your underwater. Quiver Dive Team, here’s where we get geared up before heading out to the boat. Treating us like any other qualified divers, got our tanks ready for everyone, time to get started it’s 8AM in the morning we’re gearing up to head out it’s the best time and not much waves, which makes it easier to dive. We pack all our equipment nicely after each dive so now it’s just gearing up. Fluffy and myself done gearing up while waiting for others and his chilling. That face is too cute! Busy gearing up. Apparently, my class, majority are females! We’ve got 3 guys and 6 girls! Me in an oversize wet suit. On the boat, heading towards our destination, known as the “Sea Temple“. Just before thailand borders as they say. It’s about 20 plus meters in depth, we’ve got rope to assist us while descending to equalize while trying to Squeeze pop to balance air pressure in our ears. 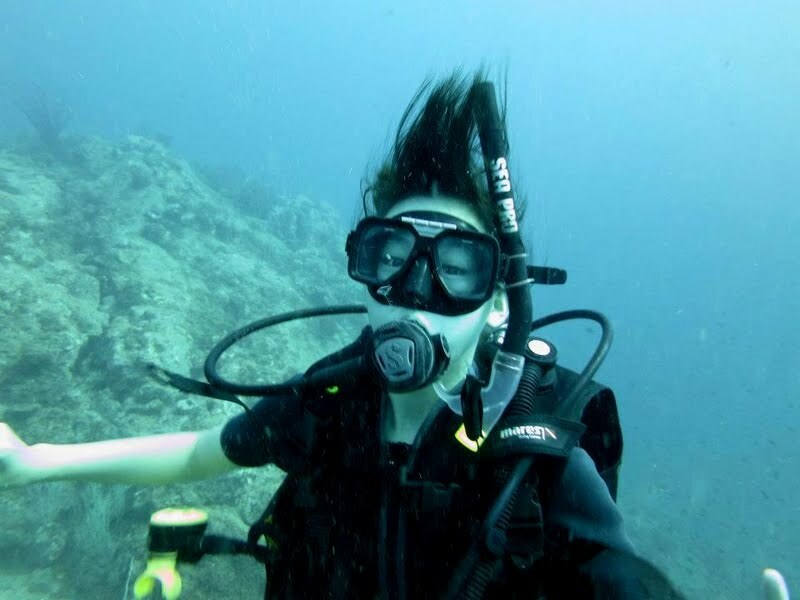 That’s me without any flash, I just realized how well my hair coud stand, underwater! As we’re advised to keep to the depth limits of 18meters (because our license only limits till 18 meters for Padi Open Water) however, some of us did exceded the limit a little, just keep equalizing underwater. Oh on another note, when moving underwater keep your hands around your waist (liked how my left hand is relaxed beside my waist in the picture above) and fin with your legs. The more hand movement you make, your just using up your energy and perhaps, breath more which your oxygen tank may not be sufficient for a complete dive so instead of your team diving for 35 minutes, you may be out of air by 25 minutes so you miss the adventure of discovering more fishes or corals.Swimming techniques do not apply during diving so don’t move your hands or kicking water because your under the water! Lots of hand and/or leg movements may injure other divers too, such as when I was diving strolling underwater all of a sudden a diver tries to catch up with us and she kept moving her hands in swimming motion, her hands literately bang into my mask, luckily I managed to grab it before water gets into my eyes, but even if water does get into your eyes, with the training from Padi Open Water course you are able to do mask clearing so you can actually remove water trap inside your mask out. So just relax and don’t panic when your diving. Spotted this feller underwater at the Sea Temple dive site in Pulau Perhentian near the thai borders. When your diving, do not touch anything and you should not bang into corals as you might damage the marine life or worst, getting a sting. Maintain buoyancy is the must at all times! It was a fun dive and since I didn’t have an underwater casing with me, our dive instructor Leslie were kind enough to take pictures of us for our first official diving for fun. So this was our dive boat where we load up all our equipment individually and head out to the waters.In case you were wondering, aren’t the tanks heavy? Well they are but to my surprise, I could carry it without much difficulties. 🙂 But for some at first it may be a little tough as it’s not only the oxygen tank we are carrying, we are carrying all of our own individual equipment which is essential to diving; such as weight belts, oxygen tank with BCD attached with regulator set, fins, face mask and snorkels. Malaysian unites as Lee Chong Wei plays against Lin Dan in the London Olympics we were all hooked on the TV during our dinner in the hotel. I will certainly miss Pulau Perhentian as we’ve reached the final day and it’s time to say goodbye. Perhentian is now a significant place for me as this is where the place I’ve got my diving license and spent the most time underwater for the past 3 days. Just some fishes beside our boat. Pretty. As we got back to the Kuala Besut Jetty it’s time to head home, gonna be a long journey. I’m already planning for my next dive trip with my friends so I’ve also checked out some of the dive sites in Malaysia and overseas. 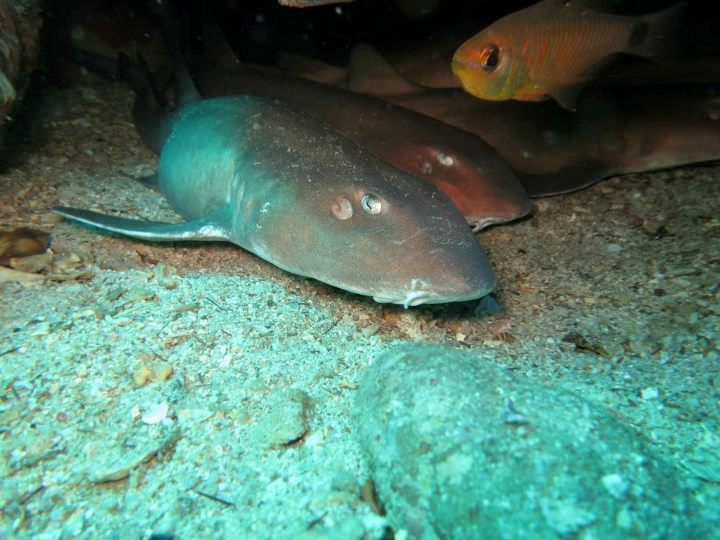 I’ve got to learn more about the marine life too so I would know what kind of fishes I spotted during diving and what species is dangerous and should be careful of!Hope my experience has some what enlighten you. 🙂 Diving is fun if you follow all the safety checks before each dive and do not panic when an emergency occurs, a good buddy is important too as they should never leave you alone. Always be prepare and plan out your dive trip. Never go diving alone or without a dive master as you are not familiar with the water conditions of a new dive locations. * you can fly to Kuala Terengganu airport too but not advisable as it’s quite far to the Kuala Besut Jetty, so the taxi ride would be an estimated of 1 hour 45minutes to reach jetty. Drive to Kuala Besut Boat Jetty and find a safe location to park your car; there are car park operators who will charge you about RM7 – 15 to park your car overnight chargeable by per day. Then take a speedboat to Pulau Perhentian Kecil. You can also get to Kuala Besut jetty by bus! Make sure when you purchase the bus ticket, the destination (location mention) is to Kuala Besut Jetty instead of the town, else you’ll have to take a taxi to the jetty. For detail information, do refer to Getting There on Pulau Perhentian website. There are a few hotels available on the island of Pulau Perhentian you can refer to here for the list of hotels. I stayed in Shari-la Resort Hotel you can read my review here. I love it <3 thanks heaps for sharing your super nice experience..
Hi Hafiz, Thanks! Glad you liked the post 🙂 I’ll be going for another dive trip in Tioman and will be sharing my experience soon too! Hi Shannon. May I know the price for the course that you took. Thank you so so much. It will help me alot. 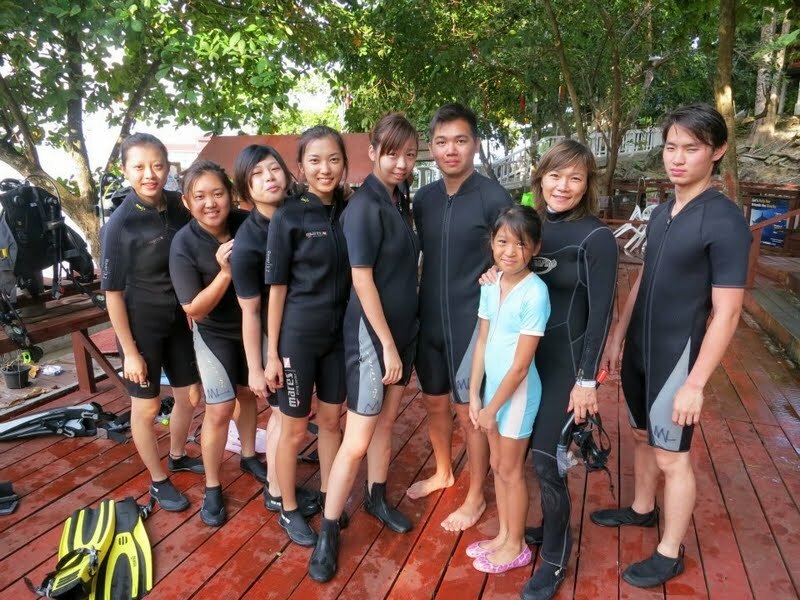 Hi Mimi, I took my course using the Groupon voucher which was RM1,100 per person. However, without groupon usual Open Water course inclusive of hotel accomodation would cost between RM 1,300 to RM 1,800 depending on location. Materials like textbook and meals will be included. Thank you so much Shannon. Just in time. Groupon just release new deal on padi diving course. Again terima kasih banyak!